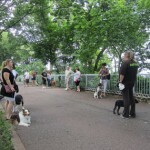 STATEN ISLAND, N.Y. – FORT WADSWORTH – Canines of all breeds, ages, and temperaments descended on Von Briesen Park, off Bay Street, last Sunday afternoon, starting at 1 p.m. 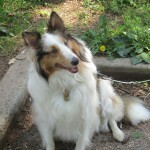 The hopeful owners shared some common goals: Socialization, and corrective training for beloved pets. 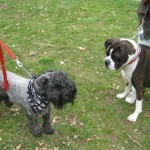 STATEN ISLAND, N.Y. – NORTH SHORE – Canines of all breeds, ages, and temperaments descended on Von Briesen Park, off Bay Street, in Fort Wadsworth, last Sunday afternoon, starting at 1 p.m. The hopeful owners shared some common goals: Socialization, and corrective training for beloved pets. STATEN ISLAND, N.Y. – ARROCHAR – Alice Marino left her well-paying, middle-management job at a prestigious advertising agency in Manhattan more than 20 years ago and never looked back. “I decided that if I had to work for the rest of my life, it had to be for me,” she said last week. STATEN ISLAND, N.Y. – FORT WADSWORTH – No parking spaces remained in the parking lot at Von Briesen Park on the afternoon of April 10. The reason? 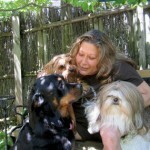 Doggie Boot Camp, the creation of Arrochar resident Alice Marino, a certified master dog trainer and animal behavior specialist who has lived on Staten Island for three decades.